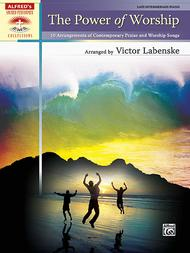 The Power of Worship (10 Arrangements of Contemporary Praise and Worship Songs). Arranged by Victor Labenske. For Piano. Piano Collection; Piano Supplemental. Sacred Performer Collections. Contemporary Christian; Sacred. Late Intermediate. Book. 44 pages. Published by Alfred Music (AP.30400).ISBN 0739053124. Contemporary Christian; Sacred.From the time of ancient Israel until the church of today, music has held an important place in worship, both public and private. The Power of Worship contains some of the most popular contemporary praise choruses. The accessible arrangements sound rich and full, and lyrics are included. Additionally, approximate performance times are provided with each arrangement, making them easy to incorporate into church services. This collection features songs from the CCLI® Top 25! Titles: Blessed Be Your Name * Hallelujah (Your Love Is Amazing) * Here I Am to Worship (Light of the World) * How Great Is Our God * Indescribable * The Power of Your Love * Take My Life (Holiness) (with Purify My Heart) * We Fall Down (with Holy Is the Lord) * The Wonderful Cross * You’re Worthy of My Praise.About Sacred Performer CollectionsAlfred's Sacred Performer Series offers church musicians a great source of beautiful piano arrangements of both traditional and contemporary sacred literature, ideal for use in general, seasonal, and special services such as weddings and funerals.